About 2 months ago, I sold my Canon 6D and all my lenses to switch to a much lighter and far better camera system, FujiFilm X-T2. About a month ago, I went to Death Valley super excited that I'd get to shoot the Milky Way with my new camera system. Two nights in a row at Badwater Basin of 50+ mph winds, so I never got to pull my camera out. This past weekend, I drove out to Joshua Tree. More specifically, I drove out to the Cholla Cactus Garden that's in the Southern area of the park. It is probably the darkest "mainstream" area of the park you can shoot the MW from. A little backstory of frustration during last year's MW season. I bought an iOptron Sky Tracker Pro last year to use with my 6D and Rokinon 24mm F/1.4 lens. The 6+ outings I had with it gave me frustrations beyond belief. I determined that my 6D and Rokinon 24mm were too heavy for it. anything more than 30 seconds, and I risk star trailing due to the weight pulling the motor faster than it should run. Many times, i would tighten everything as much as I could to make sure it was not my ball head slipping in any way, but that did not help, and I did not want to buy the counter weight and add more gear to worry about. That brings me to this year. In January, I decided to sell all my Canon gear and go APS-C with a Fuji X-T2. It is much lighter gear, and far better camera than the 6D with the only exception of low light. The 6D seems to be 1 stop less noisy at all ISOs than the X-T2, but that makes sense due to full frame vs crop. The X-T2 and Rokinon 21mm weigh 1.7lbs compared to the 6D and Rokinon 24mm at 3.1lbs. Shooting all night with my X-T2 and small Rokinon APS-C lenses was such a joy. No longer do I have weight issues pulling the iOptron motor causing star trailing. This was not the only reason I switched camera systems, but it's a nice benefit. There is another thread on this forum in which someone said the X-T2 may produce the best unmodified MW images due to the filters allowing more reds come through....or something to that matter. I must say, I do see more purples and reds than my 6D created. Even when I did 5-10 second exposures at ISO 12,800 to compare with my 6D, the X-T2 has more color. Edited by 01Ryan10, 16 April 2018 - 10:52 AM. Real nice image. Keep posting. Beautiful shot, Ryan! I can’t imagine ever giving up my Canon though the Nikon’s were becoming enticing. I think it will take some kind of major technology shift for me to switch. However, it looks like you’ve put that Fuji to great use! Edited by ac4lt, 16 April 2018 - 11:52 AM. I recently converted to Fuji X-T2 as well and i'm quite happy with it's sensitivity. But i had trouble having software like DeepSkyStacker read the raw-files. I'd very much like to be able to stack raw-files without having to convert every single raw to tiff-files. Also if converting to tiff cannot be avoided then for astro what is the best software for doing this. I have tried a few open-source/free like DarkTable and RawTherapee but i'm not really into that kind of work-process. What are your experience on this so far, Ryan? This was my first attempt this year at MW landscape. I'm not into DSOs. For the image I posted, I only used Photoshop for the editing. I blended the two exposures using luminosity masks. At this time, I don't see a need for any other stacking software since I'll be using my iOptron all of the time. Even If i do multiple sky images to stack, I'll still use my iOptron and stack in PS since there is no alignment needed. I don't foresee myself being in a more light polluted area where I may need the different subs and and stacker software..yet. Edited by 01Ryan10, 16 April 2018 - 01:12 PM. Looks great Ryan, I too love my Fuji! Saw this image on POTN. Worth a try, does a great job on mine. Thanks. Yeah, I've used it, but for tracking and stacking, there are really no alignment issues. I like using PS to blend for more control. I would definitely use Sequator if I wasn't tracking though. Here is another from the same night that I edited yesterday. Fantastic images! I wish I could drive to such location and spend the night there. It's great for astro, but the landscapes are beautiful too and allow you to make these blended shots. Love it! I'm also using a Fujifilm camera (X-T1) and had some trouble stacking everything in DSS. I'm afraid the only solution right now is to convert the RAF files to TIFF files. Perhaps one day the software will be more X-Trans friendly... But at least, there's a workaround! With the iOptron, on a Fuji, you could also try the fabulous Rokinon 135mm f/2 lens. It's a bit short for most deep sky objects, but like most Rokinon lenses, it's perfect for astrophotography and would allow you to zoom into some busy areas of the MW. There are also plenty of old school lenses to try: the advantage of the mirrorless cameras is that you can adapt barely any lens ever made with a $20 adapter. Edited by konzy, 20 April 2018 - 01:47 PM. Thank you for the kind words. I bought Irridiant X-Transformer to convert RAF files to Tiff, so they process better in LightRoom. About 3 days after I bought X-Transformer, I found that using "Unsharp Mask" in Photoshop yields excellent sharpening results with no "wormy" artifacts. As for the DSOs, I'm not really into that. I much prefer astro-landscapes. 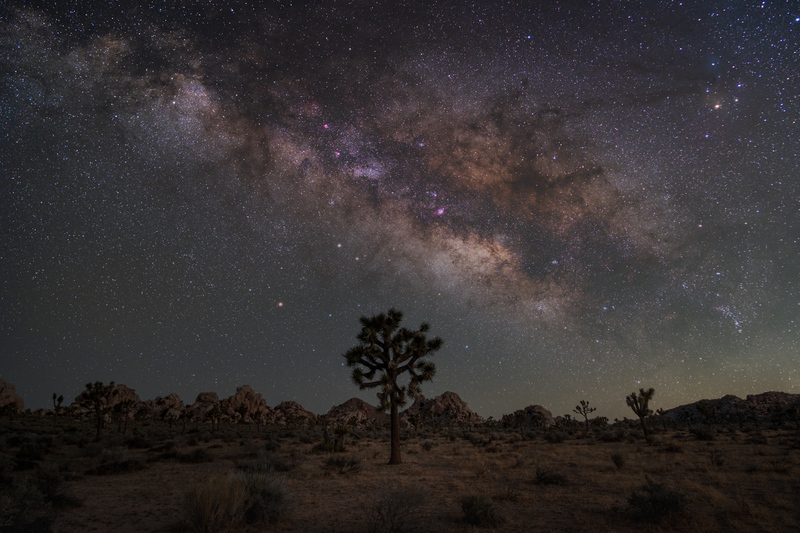 What a beautiful photo from Joshua Tree! Congratulations!! 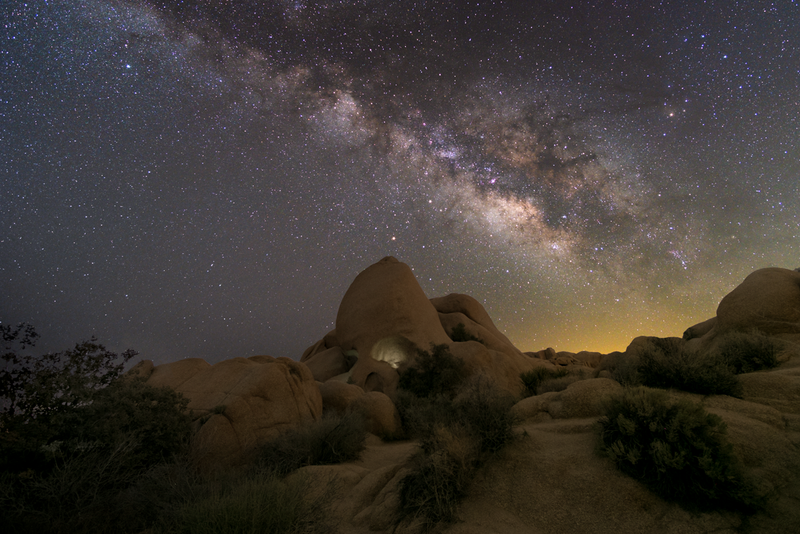 It makes me want to get ready for summer Milky Way season. I am new to Cloudy Nights, but not to the Fuji XT-1 or now the XT-2. Like you, I moved to the Fuji X system (from the Canon system). I enjoy taking family photos and landscape / nature photography (hobby only) and I have really enjoyed both Fuji cameras. About 2 1/2 years ago I was at a cabin at a dark site and on a lark pointed the XT-1 up, on a tripod with the 35mm f/1.4 lens, and took one and four second exposures. I was amazed at what could be seen! 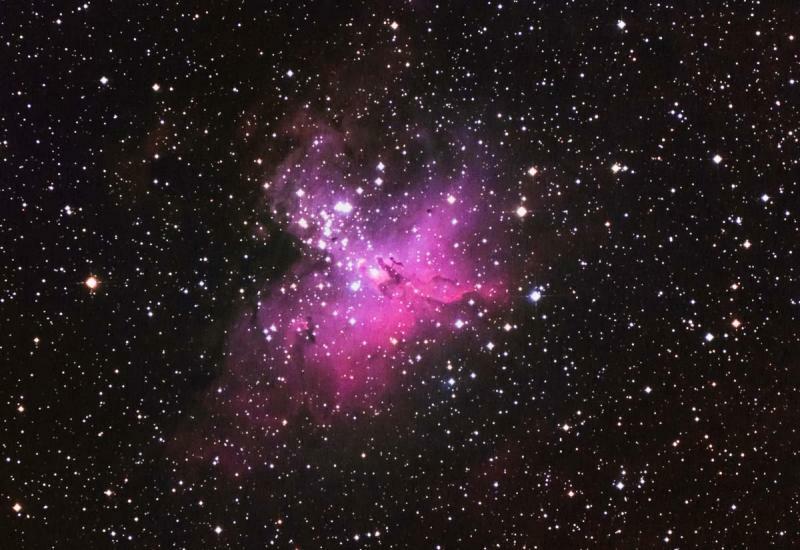 That started a journey into astrophotography which has been a wonderful experience, including a lot of learning and many initial failures along the way. I joined Cloudy Nights (finally) because I wanted to say that the XT-2 sensor is really low noise and quite good at recording Ha when compared with many other sensors. I now use a 4" refractor and/or an 8" Cassegrain (when I can sufficiently collimate it) on a GEM mount. Like you I use Iridient X-transformer, but export to DNG files which work well with DSS (including the 64-bit version) and then finish processing in StarTools and Lightroom. When using Iridient, I generally turn off all the processing options except choosing the "more detailed" one. I have so much to learn! It is clear that my limitations in taking better MW or deep sky photos is not the camera, but my understanding of how to use the camera. Yes, I hope to have a dedicated, cooled camera for astronomy some day, but I am having a lot of fun now with the XT-2 (and the battery grip which adds two additional batteries). I will try to attach three photos which show three different objects taken with the XT-1 or XT-2. The Milky Way photo is a pano from Rocky Mountain National Park and is looking into Glacier Gorge from Sprague Lake one July night. The Eagle Nebula was taken on a hot summer night with the XT-2 and shows some noise, but mostly my amateur processing skills and need to tweak collimation. 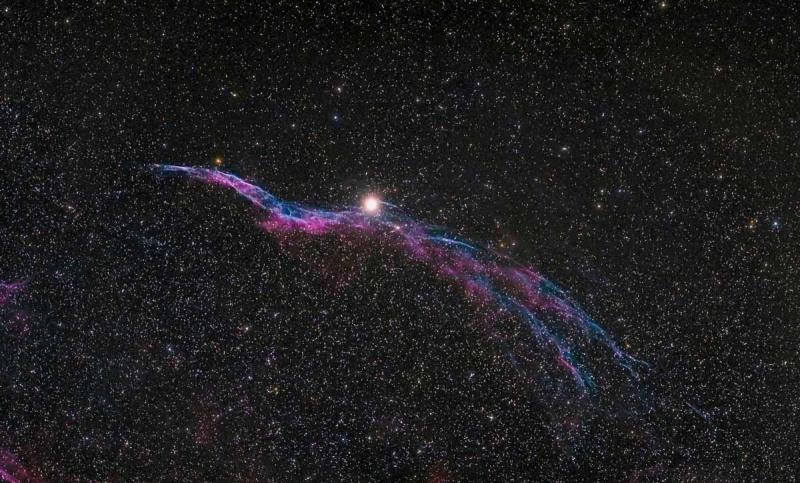 The Western Veil Nebula was taken last fall using the 4" refractor. One thing you might consider is using the camera with a tracker (like the Vixen Polarie or similar) which can allow longer MW landscape exposures (about 2x longer) and significantly longer exposures when aiming at deep sky objects (I use a 14mm Fuji f/2.8 or a 200mm f/2.8 Canon lens mostly). This hobby can be compelling, which is generally a good thing. My friends groan when Daylight Savings Time goes away in the fall, and have a hard time understanding how I can smile and see a silver lining to longer evenings! I keep on learning little by little and being amazed at the beauty of the universe through the window of the night sky. 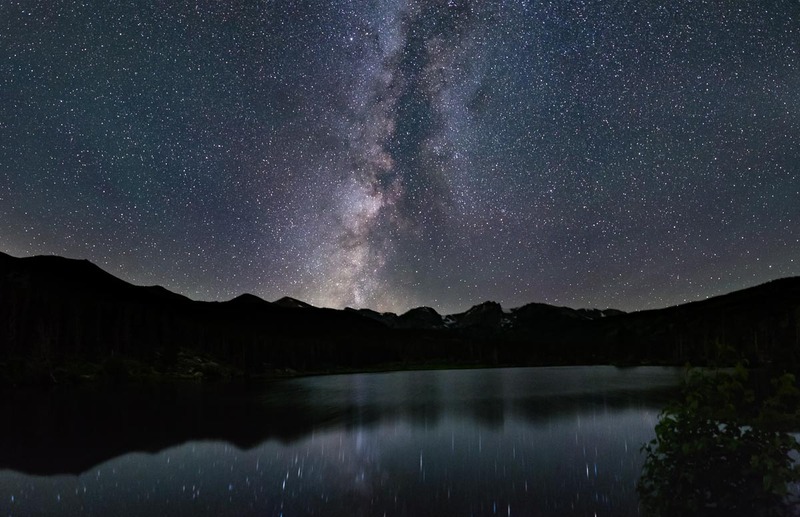 Thanks again for posting your wonderful milky way landscape photo to inspire the rest of us! Thank you for sharing your experience. It's very interesting and comforting to know that these little cameras are also very good companions for astrophotography! I didn't know it was possible to use DNG files from Iridient in DSS. That's good news, because Iridient does a great job in processing the RAF files, and the resulting DNG is much smaller than a TIFF file (2x for the X-T1). That will save me a lot of space, thanks! Your pictures are really good! I'd be interested to see more of your work! OK. 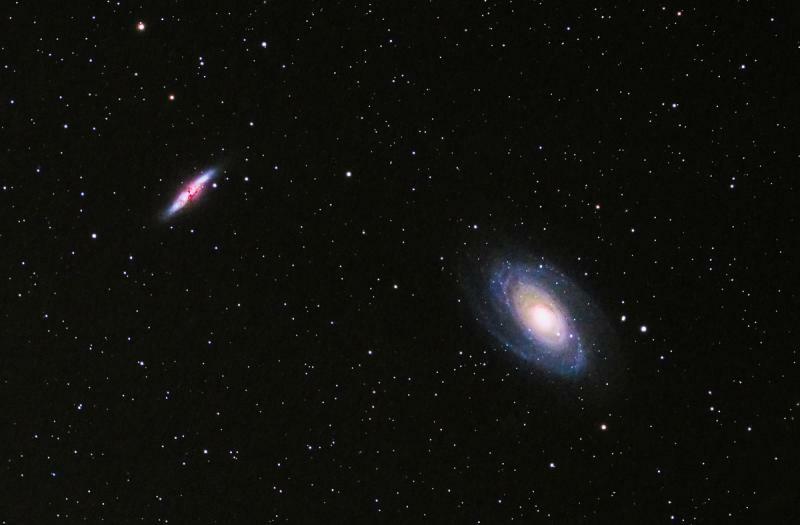 Here are the last two finished photos (taken last month) of M81 and M82. 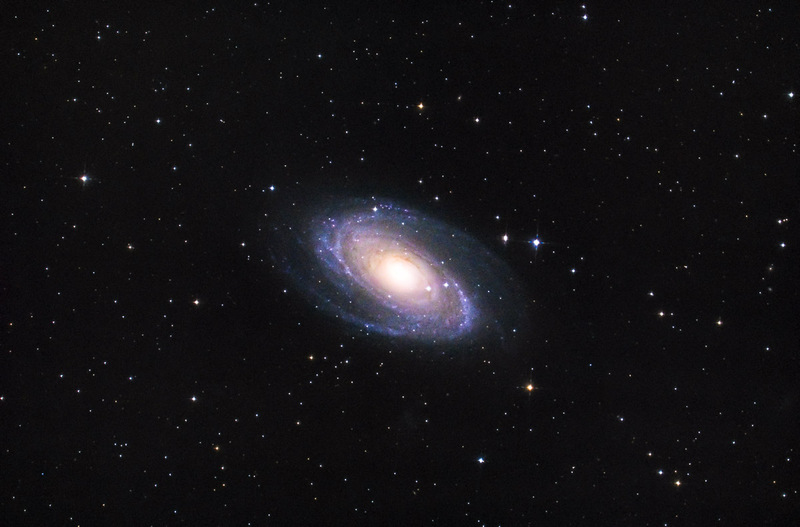 M81 had 68 useable minutes with 240 second subs through a VC200L at f/6.4 and M81 and M82 had 92 useable minutes using two minute subs through a 101mm refractor at f/5.4 from a moderately dark site (SQM of 20.2). I used ISO 1600 and There was some wind on both nights but especially with M81 and M82, and light pollution was worse with M81 and M82. If I didn't need to be at work the next day, I would have gotten more time in... but I am glad for what I was able to capture. I read way too quickly through the original post and had no need to recommend a tracker! Rather, glad to try your technique next time. Thanks again for your inspiration in the MW landscapes and looking forward to seeing your next photos. Good to see you again Matt. I was getting worried. Ryan: I have been struggling with the same issue that you had, namely stars trailing on my Sky Tracker Pro, despite what seems like a good polar alignment. My camera was also a Canon 6D (modded by Hutech), and a Sigma 85 mm f/1.4 lens, which is heavy (40 oz) and large (86 mm filter ring). Like you, I tighten everything as much as I can, but I still have issues with star trailing. I blamed the ball head, and also the polar scope, which rotates a bit in its bore, but maybe the issue is really motor and gear related as you suggest. I have a big lens investment, and am not ready to drop Canon, but your post has gotten me to realize that light weight, portability, and convenience aren't free when it comes to a tracking mount. Thanks. TL;DR: treatment is going well, but haven't done any shooting recently. first two phases of chemo were really rough from a fatigue perspective, so no energy for shooting or posting. will be around more now. Nothing to worry about yet! Only had two weeks between phases one and two of chemo (was supposed to be a month, but there was this seizure thing, and it all went a little sideways briefly), and spent a week of the month-long break before phase three decompressing in Monterey. Phase three is a veritable cake walk by comparison to the induction phases (one and two) but does require in patient stays. I'm halfway done with phase three, and things are going well. Counts are pretty good, and fatigue hasn't been too bad, and my weight is back up 15 lbs. I get most of June off from treatment, meaning I can actually go to work. After that, things get a little weird, based on whether I get selected for a drug trial or not, and if not, do I elect to pursue a marrow transplant. In the unlikely event that a break from chemo coincides with clear skies and a new moon, I'm going to head over to the Corps of Engineers rec sites on the Tombigbee river (about an hour west of here) in August, after I'm cleared to drive again. I hope everything works out for the best for you. Glad to hear treatment is going well! I hope you'll be able to have some clear nights when things get better -- there's nothing like a good dose of photography and stargazing to clear your mind. Take care! And thanks for the tip on Sequator, I'll have a look at it! Edited by konzy, 06 June 2018 - 05:43 AM. Thanks for the kind words, and I hope you have some luck with Sequator - it's something of a black-box, you stuff in files, and it spits out a stacked image, but it generally works pretty well. Thanks very much. So far, so good.